The awairdin ceremony o the 1990 prize awairded tae Aung San Suu Kyi inside the Parliament's Strasbourg hemicycle, in 2013. The Sakharov Prize, offeecially kent as the Sakharov Prize for Freedom o Thocht an named efter Roushie scientist an dissident Andrei Sakharov, wis established in December 1988 bi the European Pairlament as a means tae honour indiveeduals an groups o fowk wha hae dedicated thair lives tae the defense o human richts an freedom o thocht. A shortleet o nominees is drawn up bi the Committee on Foreign Affairs an the Committee on Development, wi the winner annoonced in October. The prize is accompanied bi a monetary awaird o €50,000. ↑ 1.0 1.1 1.2 "Sakharov Prize for Freedom of Thought". 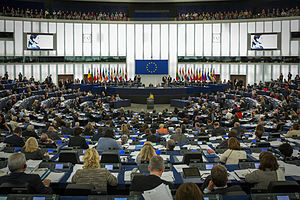 European Parliament. Retrieved 10 December 2013. This page wis last eeditit on 30 October 2016, at 23:12.